It may be winter, but according to the RAND Corporation and The Wallace Foundation, this is just the season to actively plan for summer learning. Every Hour Counts agrees and has key insights to share from leaders of summer programs that participated in the National Summer Learning Project. These programs’ practices and learned lessons have informed RAND’s latest report, Getting to Work on Summer Learning, Second Edition, and The Wallace Foundation’s Summer Learning Toolkit. For school districts, community based organizations, and intermediaries tasked with creating high quality summer programs, look no further than Getting to Work on Summer Learning, 2nd Edition and the adjoining Summer Learning Toolkit. RAND’s report provides fundamental ingredients for launching a summer learning program or improving an existing one. Essential recommendations cover everything from robust planning, academic curricula, and student recruitment, to enrichment activities, positive climate, teacher selection, and program costs. The Summer Learning Toolkit is a digital bank of tools featuring more than 50 ready-to-use planning resources for school districts and their partners to design and deliver high-quality summer programs. 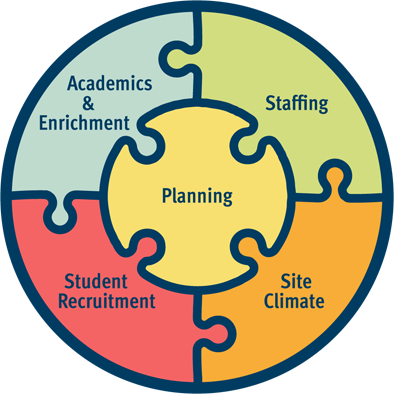 The toolkit focuses on five leading areas — planning, academics and enrichment, staffing, site climate, and student recruitment — so districts and partners can jump right into planning mode. Begin planning for the upcoming summer no later than January. See the toolkit’s Planning page for a Summer Planning Calendar, Summer Sustainability Planning Tool, Summer Learning Budget Guide, and more. Operate the program for five to six weeks with three to four hours of academics each day. The Academics & Enrichment page provides tip sheets for selecting summer curricula and using data to strategically group students. Establish a firm enrollment deadline and clear attendance policy for students. Learn how to create strong attendance systems on the Student Recruitment page. Hire teachers who have grade-level and subject-matter experience. The Staffing page provides sample job descriptions, leadership handbooks, and more. The report and toolkit emphasize real-life lessons from five cities that engaged in the National Summer Learning Project (NSLP), a six-year study by The Wallace Foundation and the first to examine to what extent voluntary, district-run summer learning programs can improve academic, behavioral, and social and emotional outcomes for young people from low-income, urban communities. Every Hour Counts spoke with leaders from four of the communities in the National Summer Learning Project to gather their insights for building scaled, voluntary, and transformative summer programs. Every Hour Counts: What is your number one piece of advice for those trying to plan an impactful and transformative summer learning program? Chris Smith: Use the community as a classroom so kids are exposed to new places, people, and ideas. For the past decade, Boston Beyond has engaged cultural resources, community agencies, and higher education and business communities to provide transformative learning experiences. Timothy Schmandt: Put a solid governance structure and project plan in place that includes roles and responsibilities, key stakeholder identification, defining success and total costs for each program, and key measures. Christine Cray: Consider the unique needs and interests of your community. Design a program based in best practices and aligned to the students you’ll be serving. Greg MacPherson: If you’re specific about who your user is and the desired outcomes of the summer program, you can intentionally plan every component and maximize the experience. Every Hour Counts: The report and toolkit stress the importance of planning early for summer learning. Why is this step so important and what lessons have you learned from doing this? CS: Before young people set foot in the program, ask the right questions so that you can set clear goals for how students will develop. What skills should students be able to demonstrate by the end of your program? What activities and staff expertise will help them build those skills? How will you measure and capture student skill development? Focusing on these questions, creating goals around them, and developing strategies to achieve these goals will help create a summer learning program in which students leave more capable and confident than when they entered. CC: You can never start planning too early! Our school system is set up to run from September — June, so planning something that operates over the summer brings a whole set of logistical challenges. One lesson learned is that our student information system stops operating in July, in order to move students to the next grade level, so we must proactively find alternatives for planning bus routes, looking up student information, tracking attendance, and more. Another lesson learned is to establish program dates and communicate staff positions early this way we can draw from a large, qualified applicant pool. Every Hour Counts: What suggestions do you have for student recruitment, using the Wallace Summer Learning Recruitment Guide ? Additionally, what advice do you have for staff recruitment? CS: For expanded learning partners, establishing strong school relationships— early and often throughout the year — will ensure you have the buy-in to attract the right teachers and recruit students to your program. Planning early for staff recruitment will also help you secure staff with the right skill set. For example, if you need staff with specialized STEM expertise, you might have to plan for higher stipends or consider university break calendars. CC: We use our rosters from prior years to communicate directly with past participants, to ensure they’re aware of the opportunity and can help spread the word to other staff, students, and families. We also complete our staffing in phases and hire all staff before student enrollment closes, creating a cascade effect: site directors can recruit their leadership teams, leadership can recruit great teachers, and all staff can encourage students to register. GM: All 8 keys to success included in the Summer Learning Recruitment Guide are important to consider. For us, making the registration process as easy and straightforward as possible has been key. In a community like Dallas, there are often multiple summer opportunities being marketed simultaneously at a school or in a neighborhood, which can cause confusion for school staff and parents alike. We worked hard to develop a registration packet that had all pertinent information while reducing the number of forms a parent must complete. Every Hour Counts: RAND found that high attending students performed better on subsequent state math and ELA tests. What advice do you have for other communities on designing initiatives that attract students and in turn, ensure high attendance rates? CC: We look to school year and past summer program attendance data to help target our outreach before programming starts to focus on students who might not be regular attendees. We also provide transportation and meals, and operate a full day program to make it easier for working families with childcare needs. Most importantly, we ensure children feel safe, welcomed, and excited to be at camp. GM: The key to attracting students and ensuring high attendance is building programming that’s relevant to the youth and communities you serve, and ensuring it’s engaging and of high quality. We’ve looked across our entire community to find hundreds of programs being offered through several community locations. This scan helped develop our Dallas City of Learning (DCOL) initiative, a city-wide system of summer learning that helps youth and families find and curate multiple free or low cost experiences throughout the summer. Every Hour Counts: Why did you design your program to be voluntary rather than mandatory and what conditions do you think communities should establish for a successful voluntary program? CS: A guiding principle in Boston has been that programs are rigorous enough to count for credit and engaging enough to attract kids and their families voluntarily. This balance of rigor and engagement fosters a sense of choice among students and families. Schools and community programs usually have a sense for which students they want to participate in their summer programming, but ultimately, the decision comes down to families wanting their students in your program. TS: A key reason is cost. If you make it mandatory, it is an expensive proposition as you need to plan for everyone. Communities should design a diverse array of programs with defined goals and desired outcomes, where teachers, parents and counselors are an integral part of decision-making to determine what’s best for students based on their needs. GM: The majority of youth in our community do not qualify for mandatory programs, so establishing voluntary programs is critical to achieving equity in access. To establish successful voluntary programs, figure out which topics are most interesting to your youth. Engagement is strongest when youth and families have programmatic options that best meet their interests and needs. Thank you to Chris, Timothy, Christine and Gregory for sharing your lessons learned with us. For more information on planning your summer learning program, see the Summer Learning Toolkit.